This New Year’s Eve, bring history back to life. 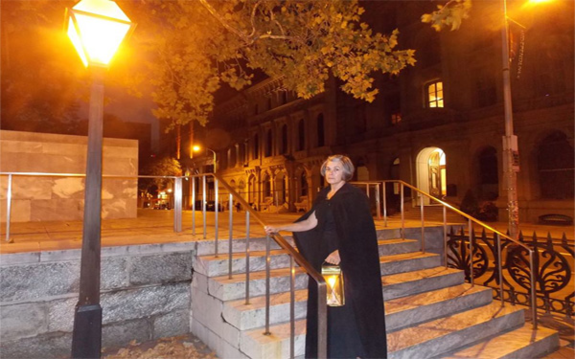 Join the 7th annual New Year’s Eve Ghost tour which will take place in Powel House, the famous venue for several high-society holiday parties in the past. Take a candlelight tour and journey through the mysterious house where disembodied dancing footsteps are still heard and where the ghost of Benedict Arnold’s bewitched wife still roam the drawing room. 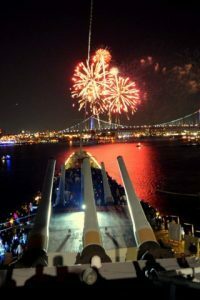 Families can enjoy the first night of the New Year aboard the USS New Jersey. Tour the ship, ride the flight simulator, eat at the chowline and sleep in bunks just like the crews of the USS New Jersey used to do. Countdown to the New Year and enjoy the midnight fireworks right from the deck of the Battleship! Welcome the New Year in style at the Anchorage Museum’s Razzle Dazzle Ball. 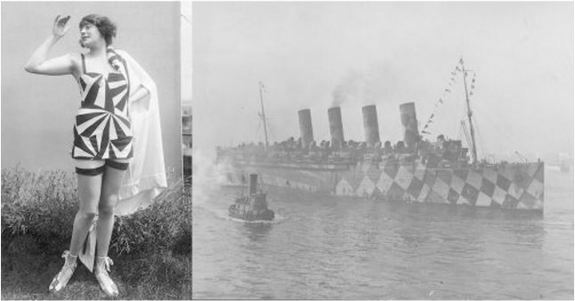 Inspired by the razzle dazzle patterns used as camouflage during World War I. Come to the ball dressed in a black and white ensemble, make a statement and stand out while dancing the night away. 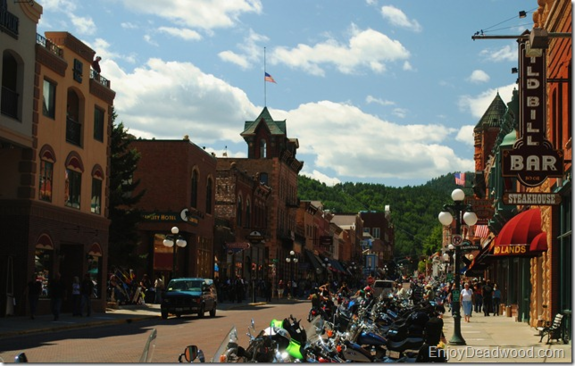 Celebrate the New Year in this old mining town. Welcome the New Year with a ball drop happening outside the historic Franklin Hotel. The fun doesn’t stop after midnight, play all night long with many of the casinos offering free champagne and party favors for everyone. Take part in Kansas City’s jazz rich history and celebrate the New Year with a bang featuring your favorite swing music and retro dance moves brought to you by the award-winning Dave Stephen’s Band. Admission cost includes live music, party favors, unlimited drinks and a midnight champagne toast. 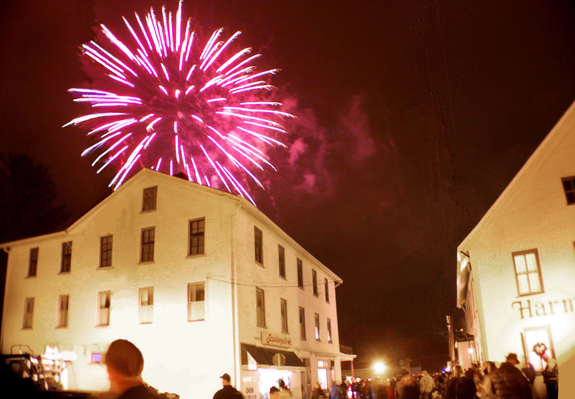 Ring in the New Year with a family-oriented “Silvester” celebration in the National Historic Landmark District that is Harmony. Inspired by the community’s historic German roots, a ball drop and fireworks display will take place at 6:00 pm which is midnight in Germany. Other German New Year’s Eve traditions include a Christmas Tree Throwing Contest, Bleigiessen (lead pouring), showing of the short comedy film "Dinner for One” and a pork and sauerkraut dinner. 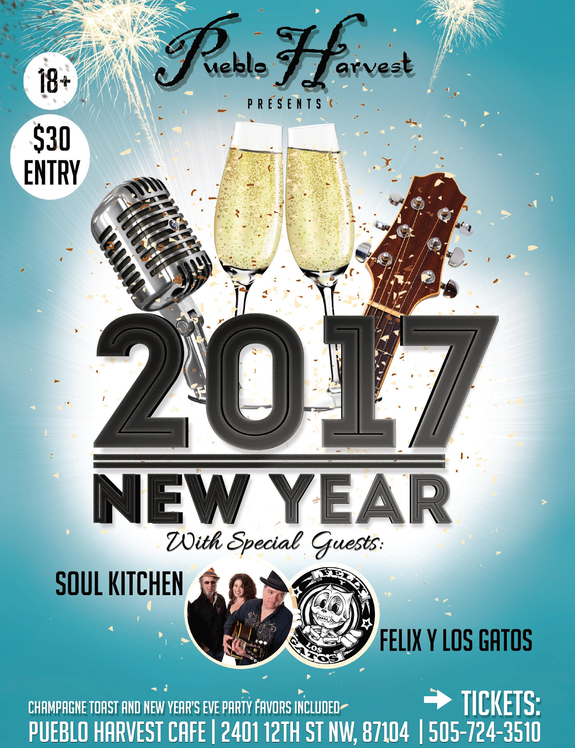 Enjoy delicious food, live music and dancing this New Year’s Eve at Indian Pueblo Cultural Center, located at the historic Albuquerque Indian School District. Feast in a special one-night dinner menu prepared by Pueblo Harvest and dance the night away at the Chaco ballrooms as you wait for the countdown and champagne toast at midnight. 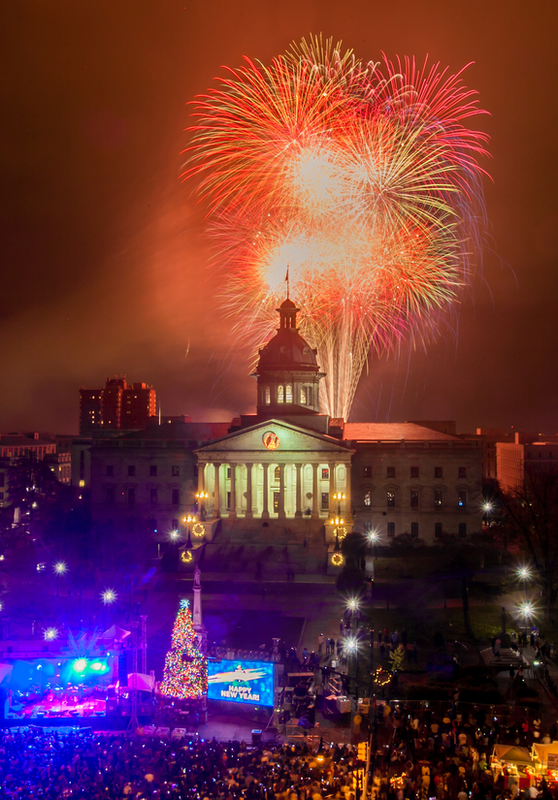 Make the last night of the year memorable by celebrating in South Carolina’s largest New Year’s Eve celebration, Famously Hot New Year. Everyone is welcome at this free event taking place at the historic S.C. State House. This event also features a full-length concert by a national headliner and capped of by most colossal NYE fireworks display in the two Carolinas. Spend New Year’s Eve in style with this two part celebration. Start the night with a Gala Concert at Petaluma’s “Carnegie Hall” featuring the music of Beethoven and Tchaikovsky performed by string players from the San Francisco Symphony and Elizabeth Walter, pianist. Afterwards, head over to Hermann Sons’ Hall and enjoy many traditional Viennese dishes and desserts served in a buffet style gourmet dinner. Listen and dance to Strauss Waltzes played by a live orchestra until midnight. The New Year’s Eve celebration starts early in New Orleans. Head over to Louisiana Children’s Museum and have a New Year’s Eve Countdown to Noon. Create your own noisemaker and paper bag hat and at 12:00 noon, delight in the confetti toss and balloon release. 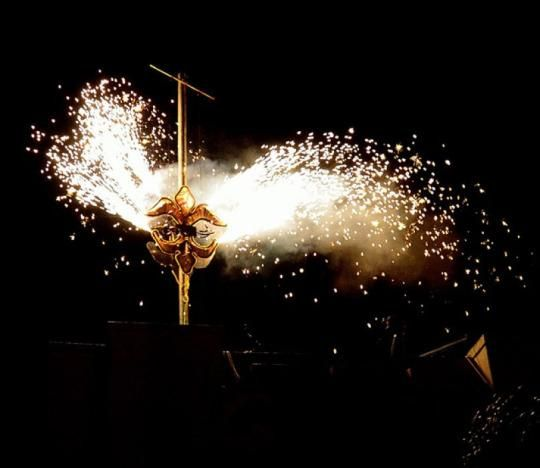 Witness the Allstate Sugar Bowl New Year’s Eve Parade in the afternoon and afterwards, head over to Jackson Square and find yourself a good spot for the annual fleur-de-lis drop at midnight. Do you have ones we should add? If so, please post a comment below. And if you're looking for a special gift for a history lover on your list, check out our store, which is what funds the operation and expansion of The History List. You'll find shirts and stickers with our original design, special commemorative shirts, and signed books by noted historians. The holiday season is a great time to support the historic sites and institutions we value through our attendance at their events, our purchases at their shops, and our show of support for what they do all year. Here are 10 great historic sites and events where you can make this holiday historic, and if you have ones we should add, please post a comment below. 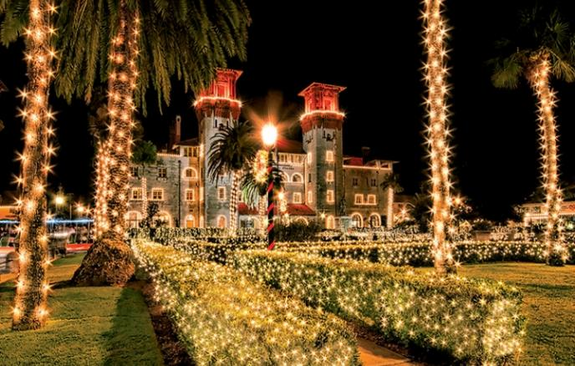 This year, St. Augustine, the oldest city in the nation, will open its doors once again to hundreds of thousands of visitors with their annual Nights of Lights. Witness the spectacle as the city glows with more than 3 million brilliant white lights, many illuminating historic landmarks, including the waters of Matanzas Bay, Bridge of Lions, The Plaza de la Constitucion and the crowd favorite, Lightner Museum. Ride a trolley, book a group tour, or enjoy the sights aboard a boat. This dazzling holiday lights display can be enjoyed in many different ways. Featuring the three National Historic Landmarks and icons of the Gilded Age in America - The Breakers, The Elms and Marble House. Each house is filled with dazzling lights, poinsettias and a total of 28 Christmas trees. 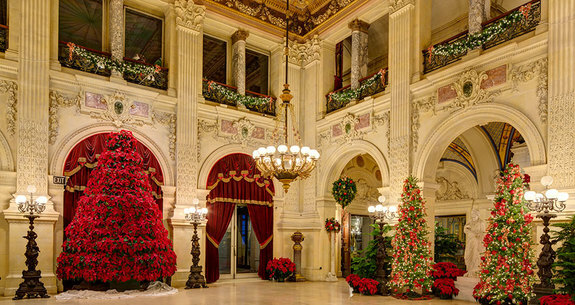 Keep an eye out for the 15 foot tall poinsettia tree and model trains at the Breakers, the Gilded Age-inspired streetscape at The Elm and the fireplace mantels of the Marble House. All three houses are open daily starting from November 19, Saturday until January 2, Monday. Tours start at 9am and close at 5pm. 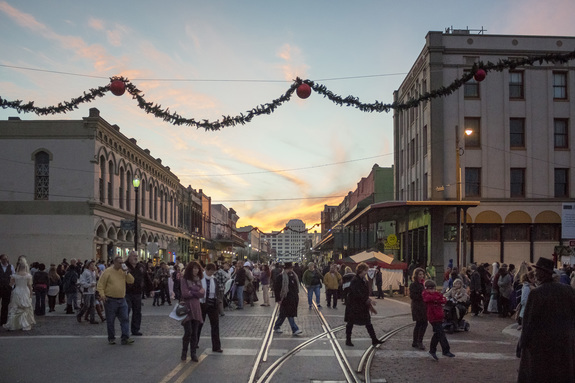 This year marks the 43rd anniversary of Dickens on The Strand, an annual holiday street festival that is inspired by Victorian London during the 19th-century. This event features non-stop entertainment such as parades, strolling carolers, wandering musicians, bagpipers, jugglers and many more. Come in your petticoats and prepare your bowler hats because Victorian-inspired costumes are admitted at half the price! 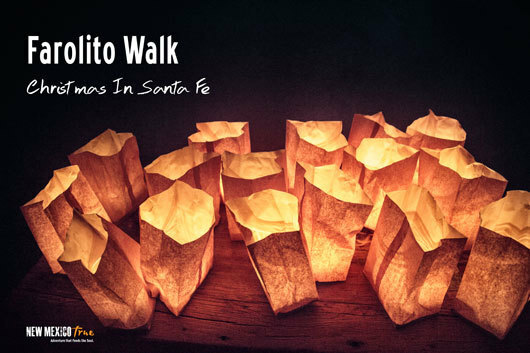 A beloved holiday tradition in Santa Fe, The Farolito Walk in Canyon Road warms the heart of anyone who joins this famous promenade on Christmas Eve. 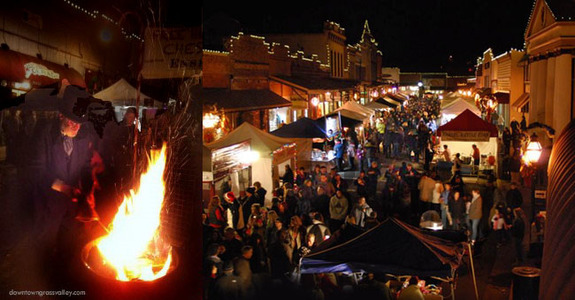 Farolitos (or the Spanish term for paper lantern), luminaries and thousands of fairy lights illuminate the historic neighborhood streets and adobe walls. Carolers then gather and sing around small bonfires as they warm themselves from the cold night. 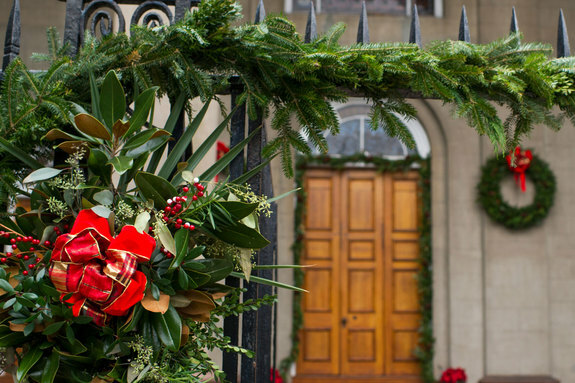 For the month of December, the City of Charleston has organized a full-packed calendar to capture the spirit of the season for everyone in the community. Marion Square is the site of the city’s Holiday tree featuring a 60-foot Holiday Tree of Lights, a Chanukah Menorah and a Kwanzaa Kinara, all beautifully decorated. Other highlights include the Holiday Parade, Student Performance Day, Parade of Boats and the Holiday Market. The month-long festivities will be capped off by greeting the New Year in a high-energy arts celebration. Activities include comedy, African dancing, many forms of music including classical, gospel and jazz, children’s activities and so much more. 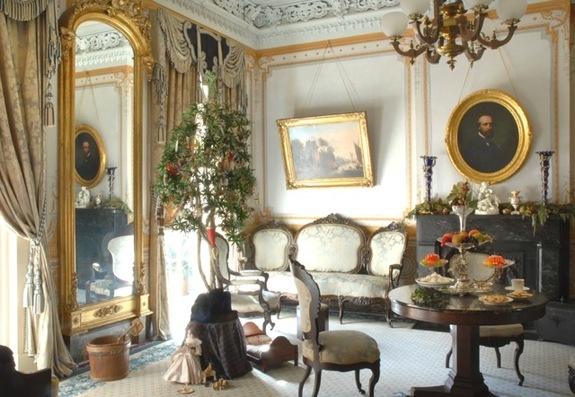 Take a step in five of the French Quarter’s historic properties dressed up in traditional Creole Christmas finery: The Louisiana State Museum’s 1850 House, Gallier House, Beauregard-Keyes House, Spring Fiesta House and the Historic New Orleans Collection’s Williams Residence. While in the Spring Fiesta House, witness an entertaining presentation of Reveillon traditions and their Creole origins and feast on a variety of delectable refreshments. A perfect activity for the whole family. Liberty’s Ice Pavilion features a large ice skating rink adorned with magical festive lights accompanied by your favorite classic Christmas tunes from the 1940’s up to the 60’s. Refreshments like coffee, hot chocolate, tea and cider, cookies, warm pretzels, popcorn, nachos and a variety of snacks are also available for purchase. 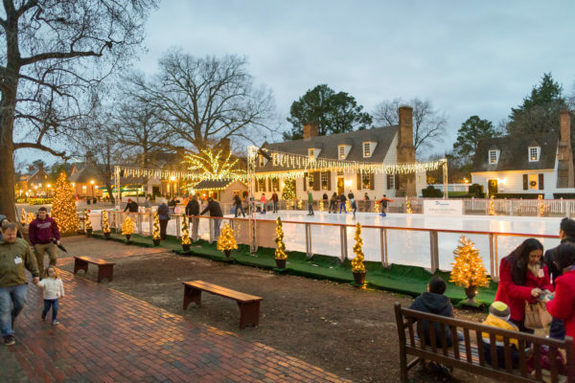 Apart from skating, you can enjoy walking tours, carriage rides and experience how Christmas was celebrated in the past. An event perfect for railroad buffs and model train enthusiasts. Participate in the 21st annual exhibition of the Model Train Festival, showcasing the most detailed railroad recreations in the Pacific Northwest. Learn how the railroad industry influenced the growth and development of the west and rediscover the stories behind the rich culture and history of Washington State. Come with the whole family on December 21-23 between 11am and 3pm and get a chance to take a picture with Santa Claus. Legos are also available in the activity room where kids can create their own Lego train creations. Relive the spirit of Christmas past by celebrating a Cornish Christmas. Stroll the streets of Mill and Main West for the sights and sounds of Christmas traditions - carolers in period costumes, jugglers, musicians, the Grass Valley Cornish Carol Choir, Tommyknocker Cloggers, and of course, Santa Claus. Your favorite holiday dishes, handmade arts and crafts, and more. 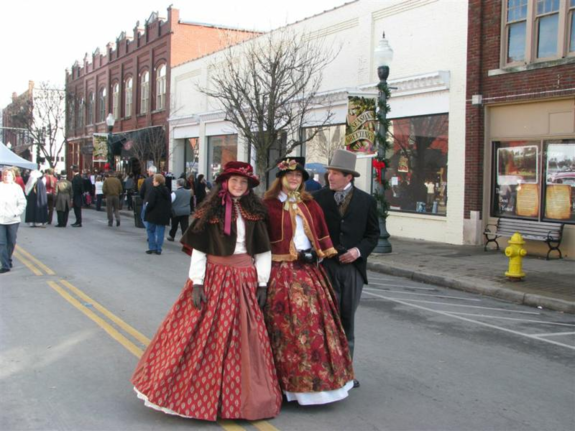 The largest Christmas festival in Middle Tennessee, Dickens of a Christmas relives the time of Charles Dickens with Franklin’s Victorian architecture as the backdrop. The 32nd annual street fair will be headlined by 200 musicians, dancers and your favorite characters from the stories of Charles Dickens including Jacob Marley, Ebenezer Scrooge and Tiny Tim Cratchit with his parents from A Christmas Carol and Fagin from Oliver Twist. Good food, horse-drawn carriages, free arts and crafts activities for kids, a petting zoo and live artisan demonstrations await you in this Christmas festival. Gather the whole family and come join the fun. Do you have ones we should add? If so, please post a comment below. And if you're looking for a special gift for a history lover on your list, check out our store, which is what funds the operation and expansion of The History List. You'll find shirts and stickers with our original design, special commemorative shirts, and signed books by noted historians. Museum Day Live! is an annual event created by Smithsonian Magazine in which participating museums and cultural institutions across the country provide entry to anyone presenting a Museum Day Live! ticket. Step 1: Browse the list below. Step 2: Contact the museum to confirm. Note: Participating institutions that aren't open on Saturday are honoring tickets for free admission on Sunday, September 25. Step 3: Download a ticket here. Each ticket is good for two people. Note: If you're interested in history, including events and exhibits at history museums and historic sites, you can subscribe to weekly lists for the states of Massachusetts, Rhode Island, New Hampshire, and Connecticut here. These are published every Wednesday night by The History List and are open to all individuals and organizations with history-related events, exhibits, and walks. Learn more about submitting events here. Compiled from information provided on Smithsonian Magazine's Museum Day Live site. Q & A with Sam Forman, author of the new YA historical novel "Twenty-One Heroes"
If you're looking for a book for young readers this holiday season that brings America's Revolutionary history to life, check out my friend Sam Forman's Twenty-One Heroes. Sam's biography of Dr. Joseph Warren was a big help to me when I was researching Bunker Hill. This interview with Sam provides an insight into his novel for young adults. As an author, you are best known for writing the definitive biography of founding father Joseph Warren. What made you turn to fiction for Twenty-One Heroes? Formal histories of our American Revolutionary era are not written from the standpoint of the young people who lived in the era. Surviving diaries and letters, written by privileged young men and women, are rare. Their language and context make them inaccessible to general readers. I turned to historical fiction to convey the experiences of more ordinary young people, interacting as friends and acquaintances over an extended period of time. Coming of age stories fit well with tales of the American Revolution. Young people must decide what they stand for and how they will conduct their lives. The reality and legends of America’s birth and adolescence provide the perfect backdrop. What was your inspiration for this story? Why were you drawn to writing a romance? My first inspiration to write what became Twenty-One Heroes occurred following a springtime romantic picnic. My girlfriend and I spread our blanket on a green space between the old Delaware Canal and the shore of the Delaware River. We soon realized that we had set up in a park-like graveyard whose residents cast a pall over the moment. Our neighbors of sorts were lying under a line of plain marble gravestones. Inscriptions marked them as unknown soldiers who had perished during the Continental Army encampment on that very site just prior to the dramatic events of Christmas Day 1776. Our picnic was taking place on hallowed ground. We were young, both just embarking on professional careers. Ultimately we went our separate ways. As I reflected on that afternoon, both at the time and later, I contrasted the modern experience to that of those soldiers. What is it about the revolutionary period that appealed to you as the backdrop for this story? As you explore your own place in the world, it is natural at the same time to learn of the creation saga of the society in which we live. I have always been attracted to stories of origins and creation. Are there other historical novels, for adults or teens, to which you would compare Twenty-One Heroes? What makes your novel different? Harkening to my own experiences as an aspiring history enthusiast starting in junior high school, fiction - accessible to my young self - hooked me into the personalities and concepts enlivening America’s story. Fiction, like Ester Forbes’ Johnny Tremain, offered up main characters with whom I could identify. The story, readily acknowledged as fictionalized, invited my further pursuit of the real stories and real challenges at America’s Founding. Recently I have been impressed by how popular culture films and mini-series, like Lincoln, Turn, and Sons of Liberty, and the titles that inspired them, have reached a broad public and gotten them excited about important historical episodes with implications for today’s world. Twenty-One Heroes is different from tales written in earlier generations. I include forthrightly challenges faced by some characters–racial prejudice, slavery, sexual harassment, disparities in opportunity, etc.–that hardly registered in written records of the time. In am convinced of their importance to actual lives as experienced at the time, and to American experience both then and now. They are integral to Twenty-One Heroes. In another respect my fiction shares an outlook common to older classics. I am an enthusiast for the American experience. My point of view is that of a diverse group of young men and women, rather than of Founding Fathers as encountered in schools and textbooks, in their formal writings, and in cold marble statues. My characters live in the present. They do not know whether they will realize their hearts’ desires, though they try mightily to do so. They do not know the outcome of the issues of their day, though they make what choices they can within the confines of their worlds. How did you select which historical figures, events, and locations to portray in your novel? How much of your depictions of them are fact vs. fiction? The kind of people I portray – lesser known historical figures, college boys, women, blacks-are only scantily documented in original sources. My characters incorporate composites of known facts about different people, what I know about the time and place in general extrapolated in fiction to an individual, and universal attributes of the human condition that appear across time and culture. As a romance, concerns with whom we love and care about, and how we chose and are permitted to show it, figure prominently. Historical figures do appear – Phillis Wheatley, George Washington, Benedict Arnold, Joseph Warren, and Thomas Paine – in manners consistent with what is known about them. The reader will learn a lot of real history from these appearances. Their appearances are very much in the characters’ present. I hope Twenty-One Heroes will be a most enjoyable real history lesson for readers. Yet the famous people in Twenty-One Heroes are subordinate to the fictional leads – Katherine, Ezra, and Joshua – and their romantic and action adventures. Twenty-One Heroes takes its title from the twenty-one unknown Continental soldiers who died at the site of Washington’s crossing of the Delaware. How much is known about these anonymous heroes? How much of that real history is woven into your novel? Since they are unknowns, all the tools of the historian could never reveal their individual, true stories. I wondered, who were these people? What were their personalities, friends, lovers, families like? Only fiction can approximate what their lives may have been like. What did your own experience as a Lexington Minutemen historical re-enactor bring to the process of writing this novel? As a Lexington Minuteman historical re-enactor I bring a tactile feel and immediacy to the imagined experiences of fictional characters. Additionally, being a physician has afforded me the privilege of helping people during trying and intensely personal times. I include some historical figures. I emphasize and sometimes speculate how they would come across in a present reality, rather than how their legacies have been polished, extracted, and analyzed by later generations of historians and novelists. Twenty-One Heroes balances language of the revolutionary period with some modern sensibilities. Why did you think it important to combine the two? Original 18th century writing and social situations can be incomprehensible to modern readers unless they are steeped in archaic language, handwriting, and the issues of that distant time. I selectively chose language to convey the period and manners. I hope I have achieved a reasonable balance of modern comprehension and fidelity to the modes and spirit of Revolutionary America. As a historian, you have stated that you steer clear of accepted wisdom and undocumented legends. How was your approach different when writing fiction? I have woven snippets of real people’s lives, extracted from original documentation with extrapolations based on universal aspects of the human condition, into a tapestry of realistically portrayed lead characters. For example, history records that a maid of Salem, Massachusetts, lost her cool and chewed out a menacing soldier during a confrontation between raiding British soldiers and townspeople on a Sunday Sabbath. Nothing, aside from her name and that single episode, is known of that young woman, the soldier involved, and how her friends and neighbors felt about that dangerous incident. In Twenty-One Heroes this footnote to history is pivotal to Katherine’s fate and her introduction to Ezra, one of her admirers. Sometimes gaps in non-fiction can be filled in plausibly by realistic fiction, so long as it is clearly labeled as such. Warren’s biography has always posed a challenge due to gaping chasms in primary sources. Anyone acquainted with early Revolutionary history knew Joseph Warren’s name and influence was writ large on pivotal events –the Boston Tea Party, dispatching Paul Revere on that Midnight Ride, and heroics at the Battle of Bunker Hill. I uncovered and analyzed key documents, found a few never before linked to him, and pursued elaborate forensics clarifying his battlefield demise. But those gaps in sources remain a challenge to non-fiction. An author can fill in the blanks to achieve a satisfying narrative of individuals’ lived experiences. In straying from the surviving documentation and filling gaps, we have entered the realm of fiction. I have incorporated a couple of undocumented legends. I judged them very likely inventions of previous generations, though memorable scenes evocative of the time period. Thomas Paine writes his most famous pamphlet by firelight on the head of a drum. A pensive George Washington hurls a silver dollar across the Delaware River as the fate of America hangs in the balance. As you were crafting the novel, did you seek any input from readers in the age range of your intended readership? Did you base any characters on actual young people whom you know? I performed reality checks with young people of comparable ages to the characters. Finding myself back in college studying a subject in which I was not engaged, I sat in the back of the classroom with others of similar wandering minds. Instead of doodling in the margins of a notebook or tossing paper airplanes, I scribbled word sketches of invented characters and scenes partly based on friends in the classroom, transposed to the American Revolution. Polishing these musings afterward, I’d pass the scenes to the individuals featured in them. Does this flirtation scene work? How would you do it differently? After a little while my ruse became generally known. Everyone it seemed wanted to be in Sam’s book. Even the professor got wind of it and fortunately was not offended. There are no one-to-correspondences with an actual person. Fictional characters are composites beyond linkage to a single living person or recognition by them. Others are total inventions based on snippets from 18th century primary sources and my own take on human nature. You aim to seamlessly inter-mix fictional and historical characters. Is this confusing? I include an appendix of principal characters, distinguishing historical figures from fictional ones. History students will enjoy succinct biographies of the real people and a glossary of authentic, but now-unusual words. Is this story grim? We have been talking a lot about soldiers’ graves. On balance, it is upbeat and patriotic. The real-life 21 heroes inspired the story. Spoiler alert: most of the fictional characters do not end their days in unmarked graves. What do you hope your readers take away from Twenty-One Heroes? I hope readers will find in it characters they can relate to, people believably grappling with the challenges of growing up and larger issues important to their community and to our modern world. Their decisions, achievements, and problems matter to each person. And they matter to our country. If sufficient numbers of readers enjoy Twenty-One Heroes and want to learn about what becomes of their favorite characters in the American Revolutionary era, I plan to continue their stories in subsequent books. I continue to write non-fiction history. A future project immerses the reader in the epic journey of a pioneer family travelling across the perilous Western and Southern frontiers when the ink on the U.S. Constitution was not yet dry. A few signed copies of both of Sam's books are available now: Twenty-One Heroes and Dr. Joseph Warren: The Boston Tea Party, Bunker Hill, and the Birth of American Liberty. History Camp Boston 2016 took place on March 26, 2016 at the Harriet Tubman House in Boston. The event was sold out more than five weeks in advance. This report shows selected social media posts in aggregate, followed by highlighted posts. More information on History Camp, including links to presentations at History Camp Boston 2016 and to presentations at other History Camps. To improve readability, click on the expand icon (arrows) in the lower right hand corner of the frame below.